Do the Moto G and Lumia 530 need to worry? 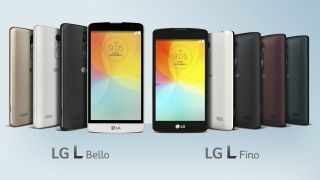 LG has announced two new smartphones that it will show off at IFA 2014 in Berlin, with the LG L Fino and L Bello aimed at the lower end of the mobile market. Both phones inherit some interface features from the flagship LG G3, including Gesture Shot, Knock Code, the QuickCircle Case and a front camera light. The LG L Fino is the smaller of the two handsets, boasting a 4.5-inch 800 x 480 display (with a 207ppi pixel density), 1.2GHz quad-core processor, 1GB of RAM, 4GB of internal storage, 8MP rear camera and a VGA front facing snapper. You also get a 1900mAh battery, Android 4.4.2 KitKat and the choice of white, black, gold, red or green finish with the L Fino - although not all colours will be available in every market. This puts the LG L Fino in Nokia Lumia 530 and Motorola Moto G territory - which is some seriously tough competition. Meanwhile the LG L Bello sports a larger 5-inch display, but with a 854 x 480 resolution the pixel density is lower at 196ppi. That means the screen will appear more pixelated, which may be off-putting. The L Bello does pack slightly more power with a 1.3GHz quad-core processor backed up by 1GB of RAM and 8GB of internal storage. You still get an 8MP camera on the back of the L Bello too, but the front camera gets a boost to 1MP and the battery increases to 2540mAh. Colour options are more limited here, with the L Bello rocking up in white, black and gold, while Android 4.4.2 KitKat remains. Both handsets will make their debuts in "key 3G markets" in Latin America (neither handsets have 4G), but LG has confirmed that it will roll out the devices to more locations in Europe, Asia, and CIS soon. Exact release dates and prices are currently unknown, but you can expect both to carry highly reasonable price tags.